It is my pleasure to serve as your President for the next two years. Even though Peggy McGee is small in stature she has mighty big shoes to fill. She will continue to serve on the board supporting community relations and as 3rd Vice President. There are many of you I have not met yet but hope to get to know you all over the coming year. My husband (Doug) and I moved here three years ago from Anchorage, Alaska where I was involved in commercial real estate and human resources. Between us we have three children and two grandchildren. They are located in Alaska, Idaho and Nebraska. Besides being involved and volunteering for TWOQC I love to read, meet people and hear their stories, play various games and try as many crafts and art projects as possible. Together, I look forward to working alongside all of you to help meet the needs of our community. Note: All the members of TWOQ extend their condolences to Marianne after the sudden death of her mother on January 7. Our thoughts and prayers are with you at this sad time. The monthly meeting will be held at 10:00am in the Madera ballroom on Monday, January 25. ♥ TICKET SALES ♥ Tickets for the February 12 Fashion Show will be on sale in the Madera lobby on Friday, January 8 from 1-3 p.m. Tickets are $25 each. They can also be obtained by calling Nancy Jacobs at 970-946-3910. Tickets for the 50-50 raffle will be on sale at the same time. Raffle tickets cost $1 each, 6 for $5, 14 for $10, or 30 for $20. Cash or checks made payable to American Cancer Society. For that raffle, one does not have to be present to win. Be sure to bring address labels to make filling out the tickets easier. Or you can make labels with just your name and phone number. ♥ DONATIONS ♥ We are in need of baskets and more importantly prizes for the raffle to raise funds for cancer research and programs for survivors. If you received something for Christmas that is not you, please consider re-gifting it to the Fashion Show. Or if you got chocolates and have weight loss as a New Year’s resolution, the Fashion Show committee will graciously accept them. Prizes and baskets may be dropped off at Ginny Hutcheson’s house, 2494 E Bluejay Bluff Lane at any time. Please put your name, address and items donated on the form in the box so we will be able to acknowledge your donations. ♥ DECORATIONS ♥ The Fashion Show decorating committee needs some empty wrapping paper, paper towel and toilet paper cardboard rolls to make firecrackers for the event. The wrapping paper and paper towel size are what is needed most. They also need metallic wrapping paper in gold, silver, red and purple. They do not have to be full rolls. If you can help, please drop things at Ginny’s house at any time. Equine Voices (remember the presentation last April?) is having a Rummage and Tack Sale on Saturday, January 9 from 8-2 at the ranch located at 1624 Dove Way in Amado. In addition to items for sale, there will be food vendors on site and they will be raffling off some fantastic items to raise funds for those special animals. The correct address is 1624 Dove Way in Amado (previous misprinted as 1924). Don’t forget to check out our Facebook page and Like us and Share us with your relatives and friends. There is a short video about the upcoming Fashion Show. 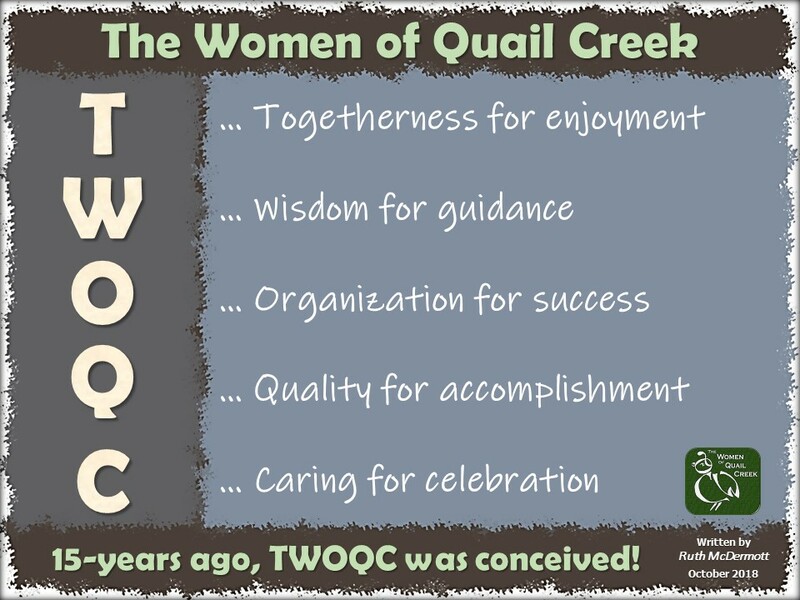 Click here for a direct link to the page: TWOQC FACEBOOK. 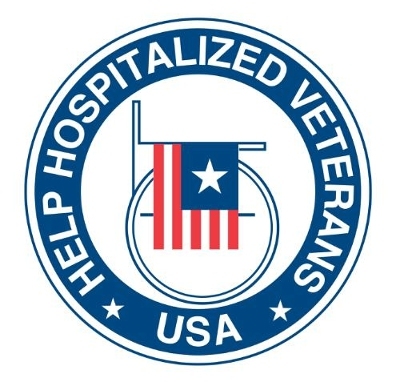 If you traveled over the holidays and brought home some of those travel sized toiletries, please consider donating them for the homeless and hospitalized veterans. If you got more calendars than you can possibly use, Peggy can take those to the VA too. You may bring items to the meeting on January 25th. If you won’t be at the meeting, you may drop them at Peggy’s house at 1908 E Longspur Place. The 2016 dues are now overdue, if you have not yet paid your 2016 dues don’t panic. You can still renew. The first planning meeting for the 2016 Baby Shower for National Guard Military Moms will be held on Monday, January 11th at 11:00 a.m. in the Kino Conference Center. The shower will be held on Saturday, June 25th. Remember, if you want to attend the shower, you must be a member of the committee. Be sure to check with Pam Rodgers if you are interested at prodgersaz@gmail.com. The TWOQC Scholarship Committee wants to thank you for your continued support in making the first scholarship fundraising season a huge success. Thanks for stepping forward to encourage the young women of the Sahuarita School District. The Green Valley Gardeners will be having their annual plant sale in March and they are in desperate need of pots of all sizes but especially one gallon or smaller. The little plastic ones that plants come in when you buy them work great. It’s okay if they are dirty. They can be delivered to Desert Meadows Park, on Huerta Drive, just off Abrego near Prestige Assisted Living. Questions or to arrange for pick up, please call Megan Todd at 207-0402. It’s OK to leave a message.